Madagascar 3 was developed by Torus Games and published by D3 Publishers in June 2012 to an army of potential fans whom had purchased the first two installments of this game. Players can play as any of the films 4 main protagonists, Alex the Lion, Marty the Zebra, Melman the Giraffe or Gloria the Hippo and adventure their way through many levels of European fun. Madagascar 3 is an action adventure game with mini games and puzzles along the way. The aim of the game is to find your way home, obviously, and this task is conducted under the cover of a travelling circus, from which the heroes must escape at the end as well. Players will travel the world performing circus tricks to amaze and entertain crowds and promote the circus. There is a massive amount of content in this game and loads of tasks to complete. Roaming around the cities is probably one of the most entertaining things to do in this game, putting up posters that promote the circus. 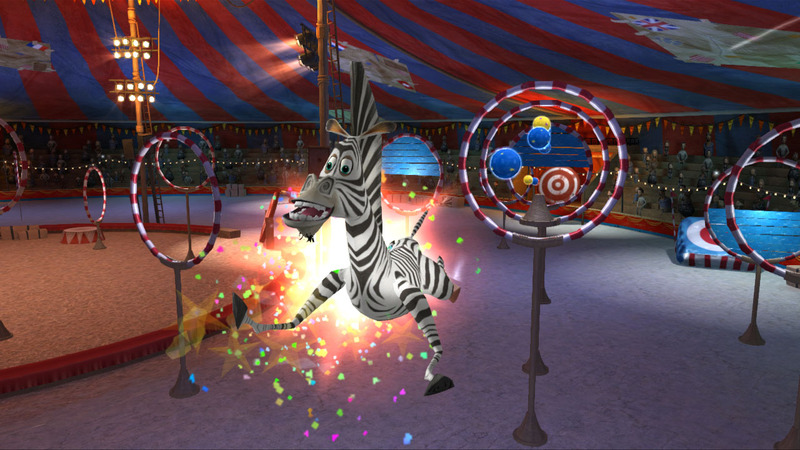 Working through the levels and earning money gives players the chance to purchase new skills and tricks for their circus routine. These improved tricks send the crowd wild and further your circus career. The graphics in Madagascar 3 are crisp, clear and good fun. There is an obviously cartoony feeling to the game, very much in keeping with the movie and game franchise of old. This is certainly a sensible move by the developers as Madagascar 3 is definitely a game aimed at the younger audience. That being said though, the actual game play itself is surprisingly dull and repetitive at times. There is a lot of wandering around the virtual world, putting up posters. Whilst exploring the cities is certainly good fun, the tasks that players are expected to do can become a bit of a drag. Fortunately though, the graphics and soundtrack do manage to somewhat make up for the sedate game play and create a more exciting all round experience. In summary, the Madagascar 3 game is well designed and has a reasonably involving storyline running throughout. The graphics are fun and the soundtrack adds a good level of interest to the game. Some of the actual tasks can become a bit arduous after they have been done several times before but the circus based tasks manage to make up for this, but maybe that’s just because there is chance to show off. Certainly a game that is more likely to be enjoyed by the younger gamer than the older gamer but not one that more experienced gamers should overlook completely. It isn’t really a game that can be picked up and put down at the drop of a hat, more one to spend a decent block of time playing then come back to in a few days. That being said, players could just roam around the virtual world looking for interesting stuff to see and do.